A look into Thailand's brand in the context of its South East Asia neighbours. Thailand is a brand. Like all brands, Thailand exists in a competitive world. Thai business people doing business internally or for export, foreign companies exploring or trying to break into the Thailand market — all must consider what the competition is doing and where their target market stands against those competitors. In order to help a range of clients prioritise what matters about the Thailand brand, Ai.agency undertook a new look at the country brand in the context of its South East Asia neighbours. To undertake the research we applied Significance Systems’ Significance Suite — online products which perform real-time research. These tools search the whole of the internet around the chosen subject area, analyse all relevant content, then apply quantitative narrative analysis to identify and understand the key narratives driving engagement with that subject. Or in other words: Significance Suite provides access to a bias-free machine expert, which reads everything relevant to a subject and then can tell us what really matters. 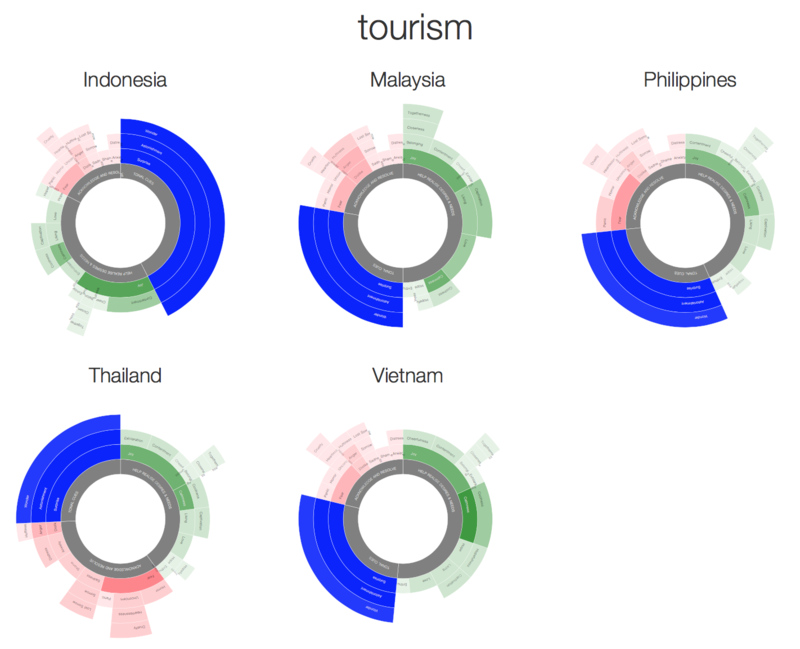 We used the platform to look at Thailand in comparison with Malaysia, Vietnam, the Philippines and Indonesia. The following is a short summary of some of the results with links to fuller reports. Over the last few years various marketers have mentioned to me that “well, the Thailand business situation is not so good”. And yes there are many macro issues that suggest that Thailand has its problems. But in a simple analysis of South East Asian countries the narrative around Thailand is not all that different from those of its neighbours. Significance Systems’ platform plots engagement with narratives on a 2×2 matrix which characterises them as either ‘Transient’ (narratives that exist in the broad subject area but are lacking any real current engagement), ‘Tribal’ (they have a buzz factor now but may not last), ‘Timeless’ (have long term deep engagement and will continue to be important) or ‘Transformational’ (really have the power now or soon to disrupt the market). 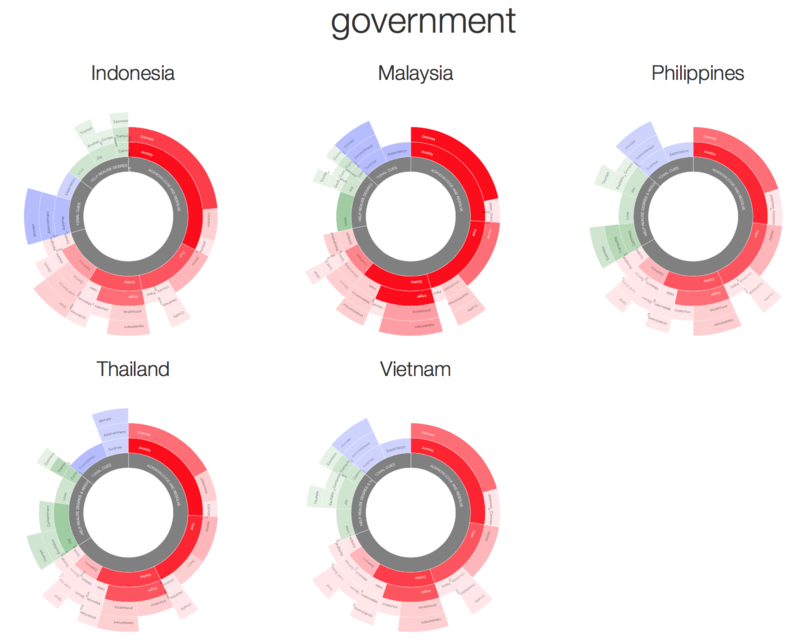 When we briefed the research platform to look at the overall narrative around the five South East Asian nations we found that initial analysis shows all five to be ‘Timeless’. All five countries are Timeless — good news as that means they are predicted to continue to grow in importance. 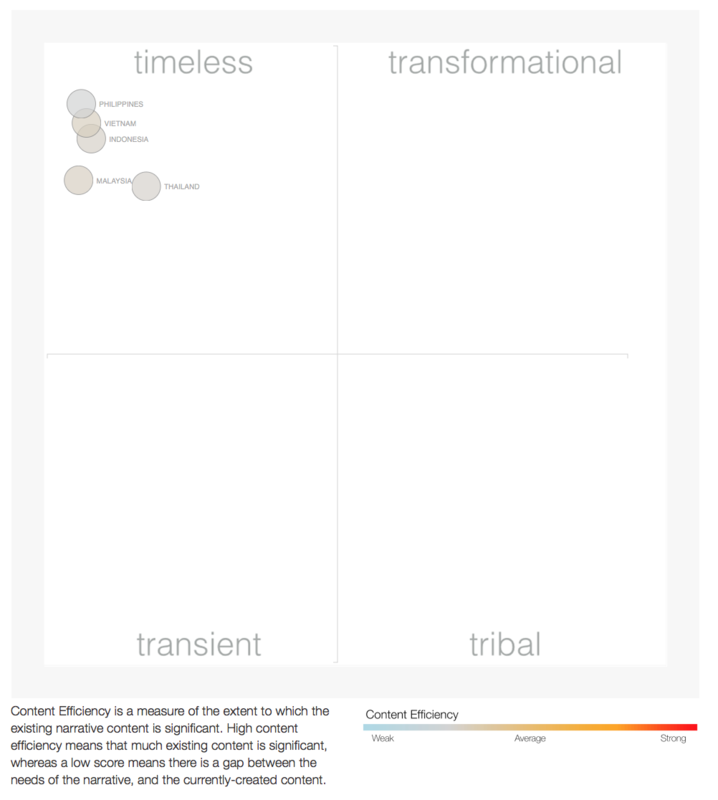 As you can see in Chart 1, all five placed high on the Timeless quadrant. Thailand is a little weaker than the others, but not bad. Or, as the full report indicates, Thailand is a market that (according to an AI-powered review of real-world engagement) is viewed by the world as powerful, positive and inspiring of delight. It is active and will continue to have momentum. But it struggles against its near rivals. In Chart 2, the platform has accessed the most engaging online content related to the individual country narratives, and analysed the emotional responses to that content. 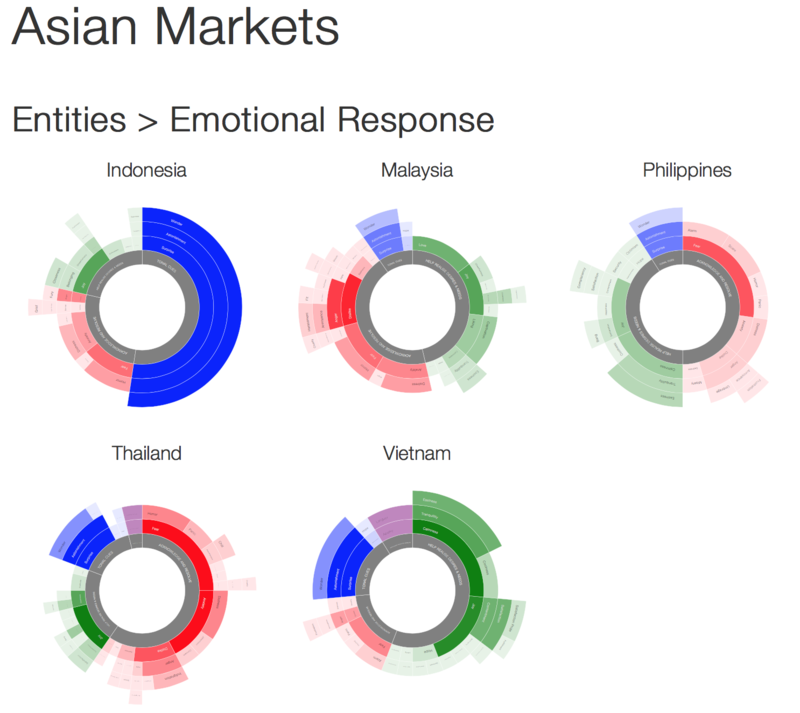 In essence, this chart shows the emotions inspired by each country. Negative emotions like fear, concern, anger are shown in red; positive emotions like joy and love in green. Tonal cues like surprise, astonishment, wonder are shown in blue. The richer the colours the stronger the emotional response generated by the narrative. And it is here you can see the difference between the country brands. Malaysia: Again, a good deal of negative emotion, though not as strong as Thailand and probably centred around internal political frustrations. But also nearly as much positive green joy and love. Indonesia: Full of surprise and expectation, a narrative that suggests lots of potential is expected and while there is some negative emotion it is not that strong. Philippines: An even distribution of positive/negative emotion generated though a larger, stronger streak of fear probably related to concerns from outside about the current government. But not little in the way of surprise, meaning the narrative around the Philippines is one where “new” is not expected. Vietnam: Lots of green calmness and joy. And a good dose of blue surprise and astonishment. In other words this is the narrative that most suggests new discovery and satisfaction with the market situation. So Thailand is doing ok, not too bad, but perhaps lags its neighbours as an overall story. Partly that comes from the fact it is perhaps the ‘best known’ in terms of issues, trade, tourism etc. So how then do we decide which issues Thailand does best on and where it needs to focus to improve the narrative about the country? There are many models used for assessing countries as brands. We ignored them all. 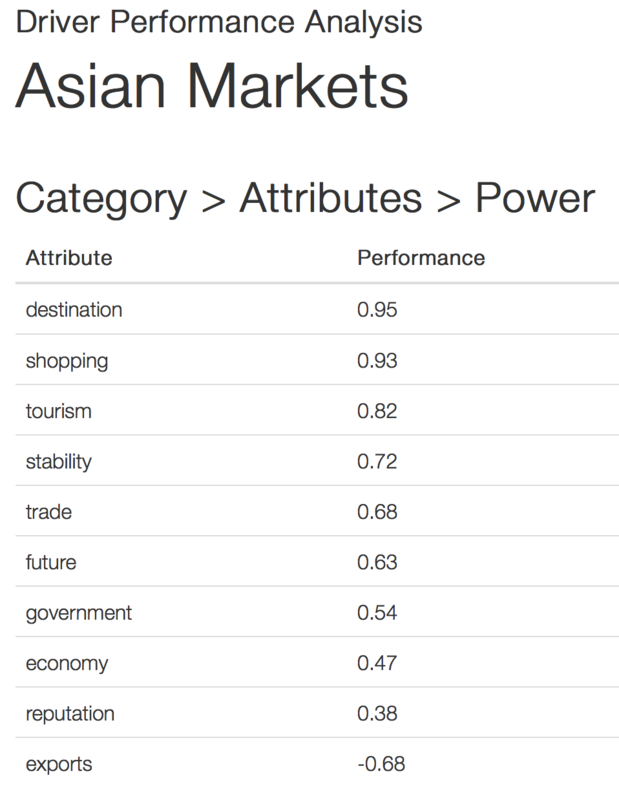 Instead we ran a power performance model to rank and score the relative importance of the ten key country attributes as defined by the Significance Systems platform itself. The attributes were derived by the platform reviewing the narratives around countries and countries as brands and deciding on ten. We then had the platform rank the contribution of each attribute to the overall brand performance score of a country as a brand. Built on a scale of 1.00 for extremely positive and -1.00 for extremely negative influence a positive value indicates that engagement with the attribute makes a positive contribution to country brand performance, where as a negative value indicates the opposite. 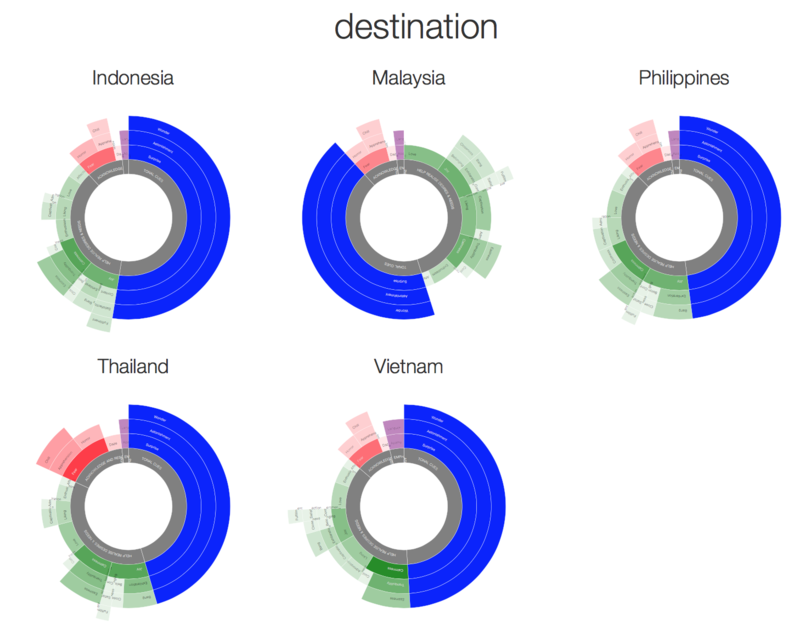 Clearly across these five South East Asian markets, destination — the country as a destination, for travel for other purposes, is the strongest performing attribute. The reputation of its exports is the weakest. Or, we might suggest, exports and knowledge of them are narratives with little positive effect on overall perception of the country. Not surprising, really. After all — would most people be able to name key exports for these countries? Also maybe not surprising that the top performing attributes are ‘destination’, ‘shopping’, ‘tourism’, ‘stability’. Images and impressions of countries are often defined by our wanting to know about them as safe, friendly, destinations for fun or work. How does Thailand compare in some of these more important attributes? Look at Chart 3 and you can see that in terms of emotions generated all five markets have a lot of good blue tonalities of surprise, astonishment and wonder. All are markets with near equal emotional responses around their narrative and that suggests they are still being discovered and explored. All have a fairly equal amount of positive green emotions like joy and even love. Only Thailand has a stronger negative red streak of fear and apprehension. Perhaps the clue as to why Thailand performs as ok and timeless as an overall narrative but not quite as well as its competitors. Too much negative news, too many stories about unrest and perhaps it is too well known already compared to competitors. As a destination it needs new news to separate it from the pack. 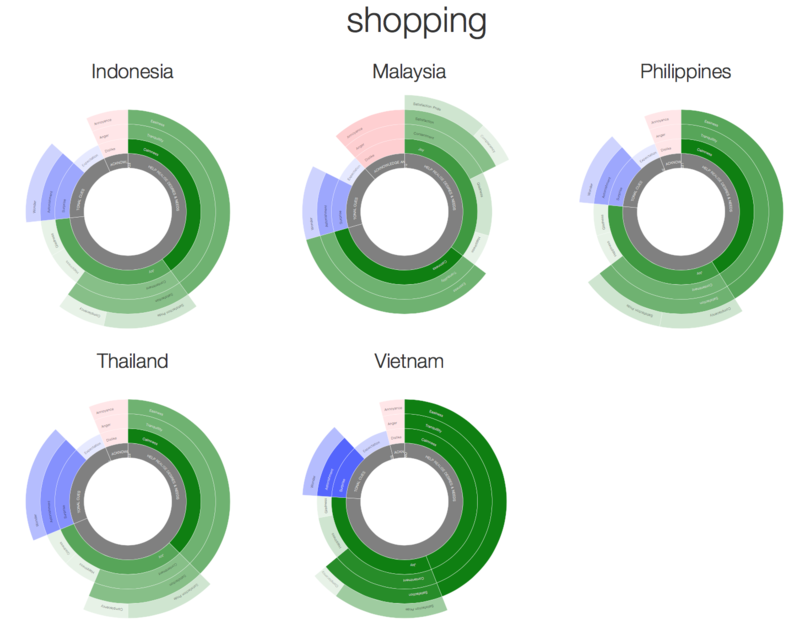 The narratives around shopping in each country are similarly positive, see Chart 4. Lots of rich green emotions like joy, calmness and little negativity. But look at the intensity of the emotion and you can see markets like Vietnam are much richer, indicating a narrative of more interest, more tranquillity and easiness associated with the experience. Of the five markets Thailand, for all its modern malls and hordes of local and foreign shoppers generates the (relatively) weakest emotional experience and narrative. In no way overall negative but less strong than it’s neighbours, maybe less easy and satisfying because again it is no more than expected and not providing as much tranquillity of experience. More work needed to make shopping even more fun and less stressful? Tourism Also Not As Exciting? Is it possible that ‘the land of smiles’ lacks a little innovation? As is clear in Chart 5 above, all five markets have rich emotional narratives around surprise, astonishment and wonder. Lots of good experiences of discovery. Also lots of green positive emotions, but little of it of a really deep green indicating that while these countries create feelings of joy and calmness (nice places to find a beach) they are not creating a lot of deep love. Some but not a lot. And while there is not a lot of negativity, Thailand perhaps generates more than others (darker red). Again perhaps because it is better known, been around longer and has higher expectations the narrative around Thailand tourism is in good but not great shape and Thailand has to be aware that markets like Vietnam and Indonesia are now creating stronger ongoing narratives. For those fixated on the future of the Thai government and whether that will effect the country, our research would indicate there are real concerns but actually no more than its four neighbours. As Chart 6 indicates, all five markets have deeply negative narratives around the state of their government. In all five countries, the narrative generates fear and anxiety much more than other emotions, but roughly of an equal level across markets, though no doubt for different reasons. So across the key indicators the Thailand narrative suggests it is not much different from its neighbour rivals but perhaps suffering from being a bit better known, less ‘of a new thing’ and while widely enjoyed it is providing concern and anxiety that any marketer must take on board. When you look at the Thailand market be aware to consider that the narratives in the international marketplace around how it is seen as a destination, a tourist location, a place to shop and its perceived stability are the things that matter in how it will be judged and measured. Thailand is actually in a pretty good place compared to its neighbours and perhaps not as negative as many living inside the country may feel. Too often residents and long term market participants judge a market by only looking ‘inside’ without really considering how it compares to similar markets in a neutral way. Having said that Thailand suffers from ‘anxiety’ across a range of key attributes and perhaps because it is a more ‘known’ market compared to its neighbours it is in more need of uplifting and new ideas and content feeding its narrative in order to assure those considering it versus other South East Asia markets for business.